Personalize your luxury marriage proposals and romantic events with Dare to Dream. 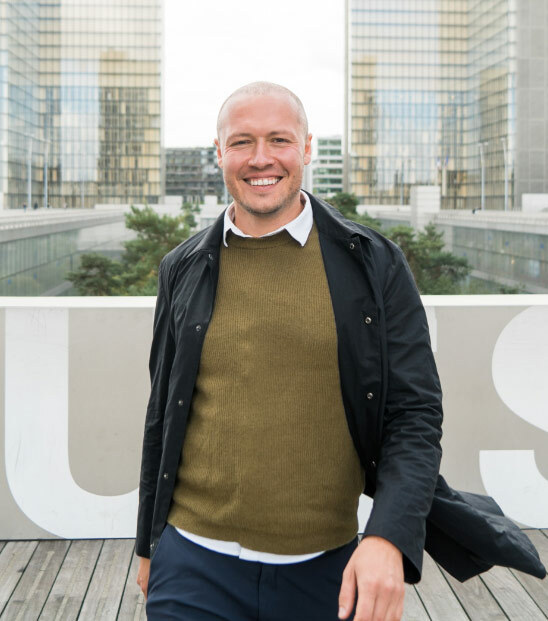 Create the ultimate engagement experience with a wide range of proposal ideas. 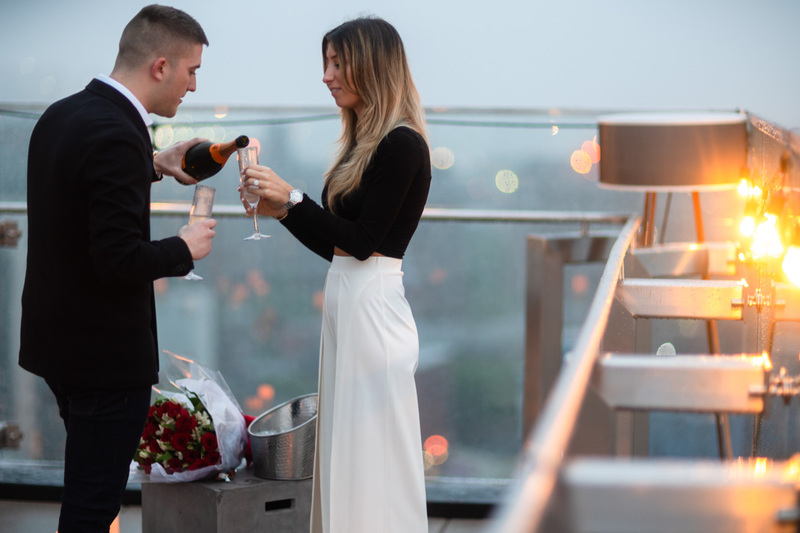 From getting down on one knee on an intimate rooftop to a full-screen Times Square Billboard, we help each client coordinate the perfect proposal and romantic event. 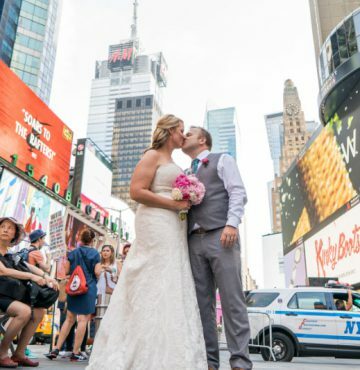 Dare to Dream NYC have helped over 800 couples plan and capture memorable “she said yes” moments. 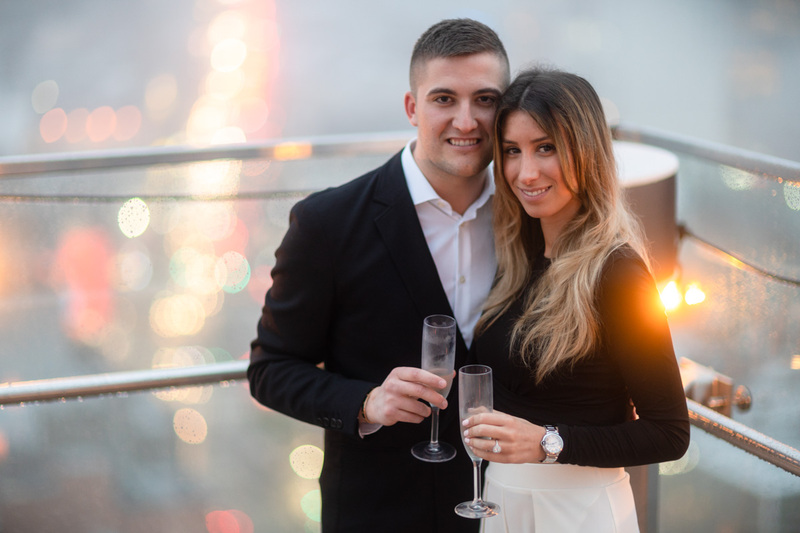 Our talented wedding and proposal planner Tatiana Caicedo and NYC famous proposal and wedding photographer Vlad Leto, love what they do to let you dare to dream big when popping the question. Completely surprise her/him by taking their breath away with a luxury marriage proposal. Let go of the stress, Dare to Dream is here to help you every step of the way. We know the hidden gems around the city that offer the dream backdrop to ask for their hand in marriage. Choose the proposal package that best suits your individual style to best express your love. You know you want to ask him/her to marry you and you want it to blow them away, but you are not sure how to make it happen. We are experts in creating unique proposal ideas that reflect the personality of each couple based on your special relationship. 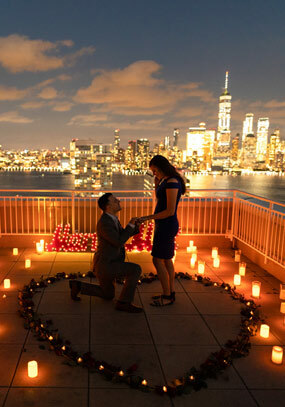 Let us help you create, coordinate, and capture your luxury proposal and romantic event in NYC. Contact us today and we will create a custom package as individual as your love. The “she said yes” moment is about to happen. Never forget how they look once they realize the day they have dreamed of is about to happen! 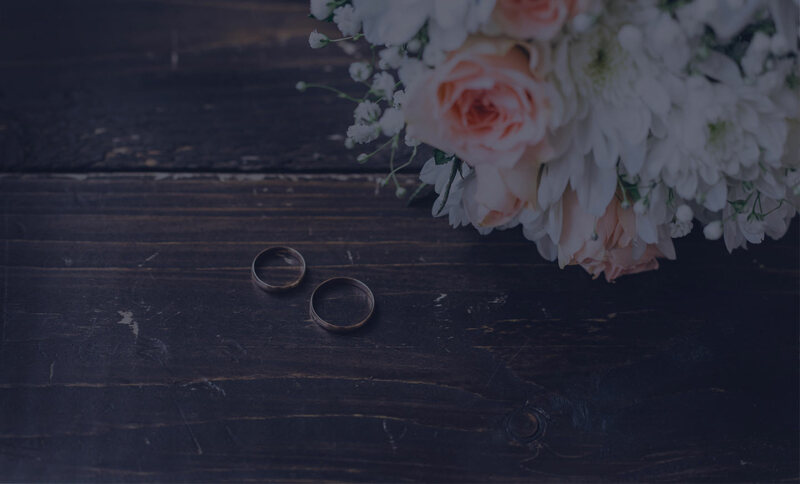 We capture the discreet moments leading up to you asking for their hand in marriage without them knowing as well as the proposal and the first moments of your engagement. You know you want the proposal to have a WOW factor. You know you want it to be as special as your love. What you don’t know is how to make it all happen. Don’t worry, we have helped hundreds of couples create the perfect proposal. We want to make your dream a reality. Tell us all about your love, your relationship and that special someone in your life. We will help you plan a proposal as unique as your love. 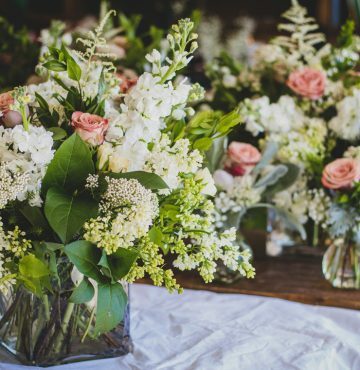 We take care of everything, from the venue to the flowers to the photography. We will provide you with a map to the location and stay in contact with you every step of the way. All you have to do is pop the question! Enjoy the freedom and stress-free day when you hire a professional proposal planner. You won’t have to worry about a thing! Dare to Dream will make this an unforgettable day for both of you! So, you’ve finally found The One. You’re ready to start the next chapter in your life together. You even found the perfect ring, but now the difficult part comes in: Popping the question. 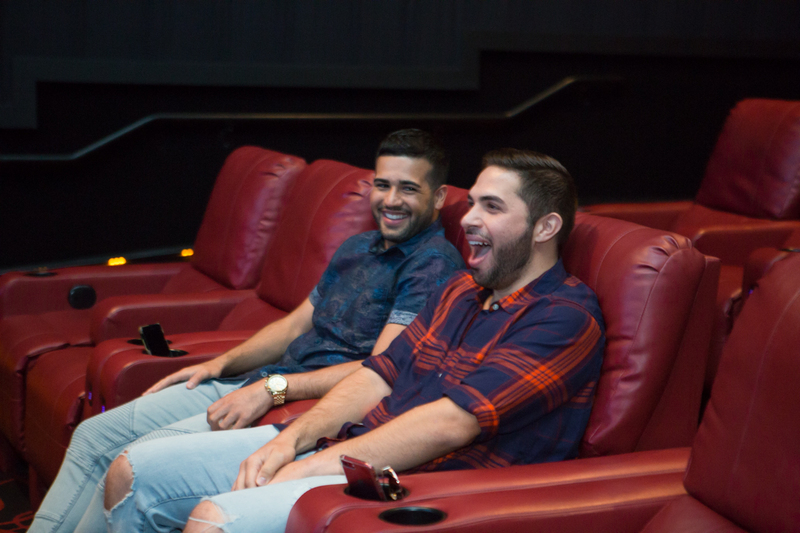 How do you surprise your partner and make this special moment absolutely unforgettable? Pinterest is full of ideas and inspiration, but in truth, it’s also incredibly overwhelming! Not to mention, even a “secret” board can easily be discovered by your partner, completely ruining the surprise. Not to worry, that’s where we come in. 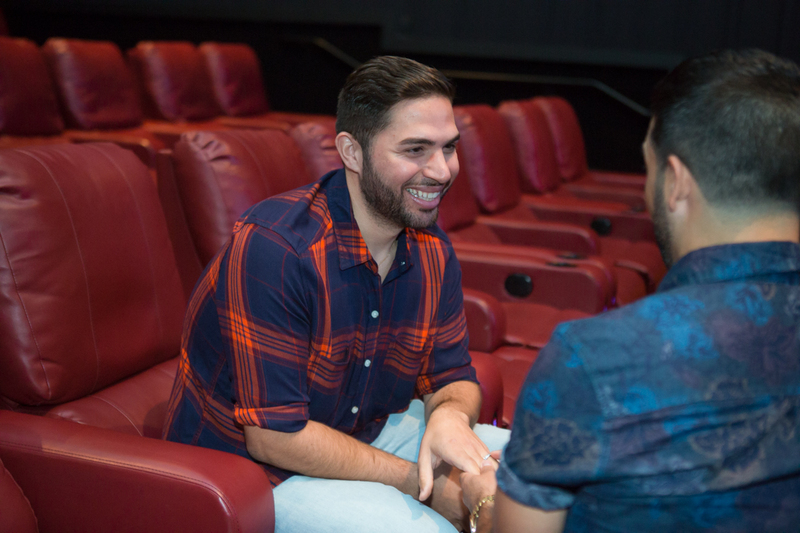 Dare to Dream has helped organize more than 300 proposals in New York City. From coordinating a huge flash mob in the middle of Times Square to an intimate, romantic picnic in Central Park, we know just how to make your day both personal and memorable. Every couple is different, so we don’t do “standard” proposal packages here. Our ideas are designed to inspire you while being easily customized to your personality, relationship, and engagement vision. New York City is one of the most visited cities in the world. Breathtaking skyscrapers, unique architecture, beautiful gardens and expansive parks set the scene for countless stories of romance. New York is the city where anything is possible! 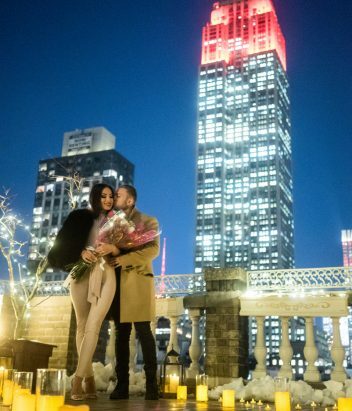 Picture yourself proposing with the iconic Empire State building or Brooklyn Bride in view. Grab a boat to Governors Island and propose at a luxury glamping cabin. 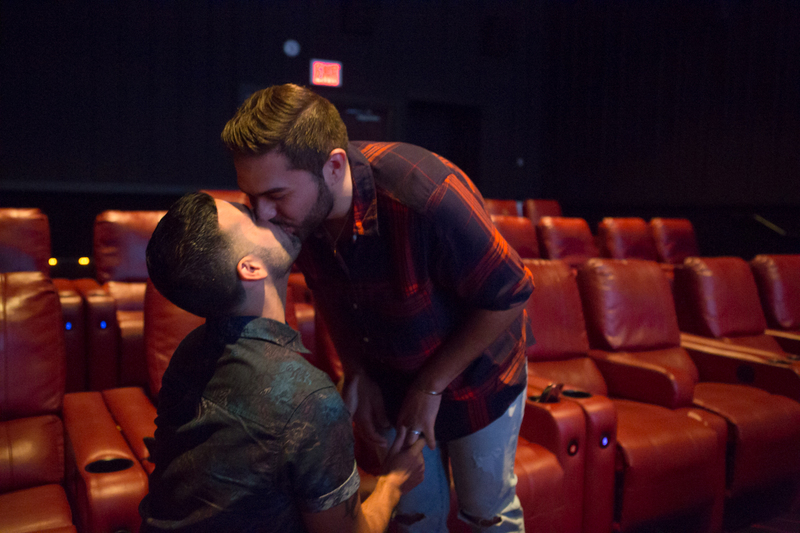 Visit a Broadway show and pop the question at center stage. 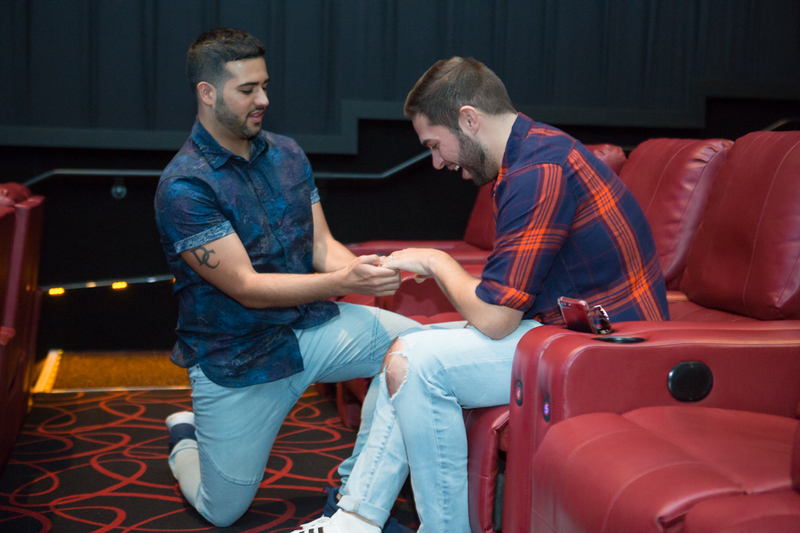 Pop the question on the big screen in the middle of Times Square or on a private downtown penthouse rooftop. Why not steal away for a romantic getaway to upstate New York, or perhaps on the bridge in Central Park where you shared your very first kiss. The only limit is your imagination. So, why propose in New York? 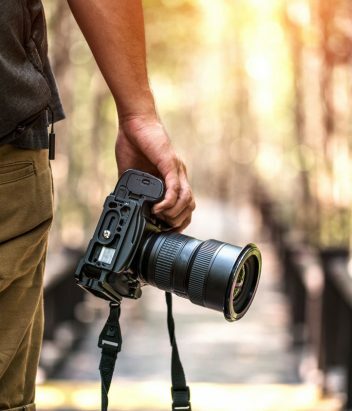 With so many picturesque places and iconic attractions, there are endless opportunities to create a moment you and your beloved will never forget. 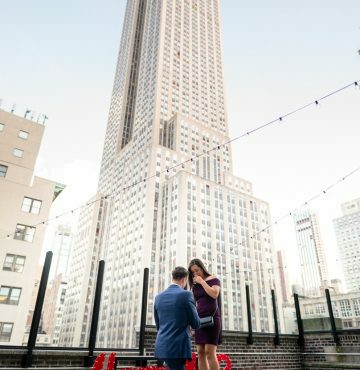 What are the best places to propose in NYC? New York is an incredibly photogenic city, bursting with beautiful backgrounds for your proposal. 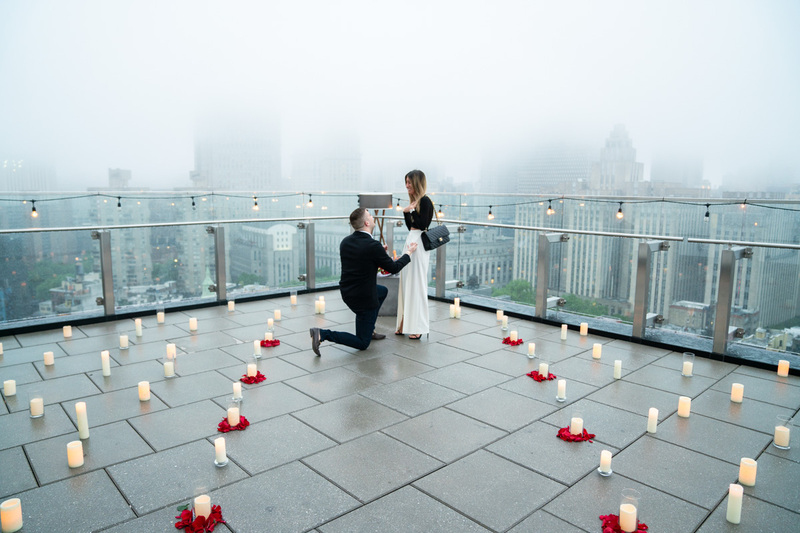 Few places are as iconic for a proposal as the Empire State Building or Top of the Rock observation decks. 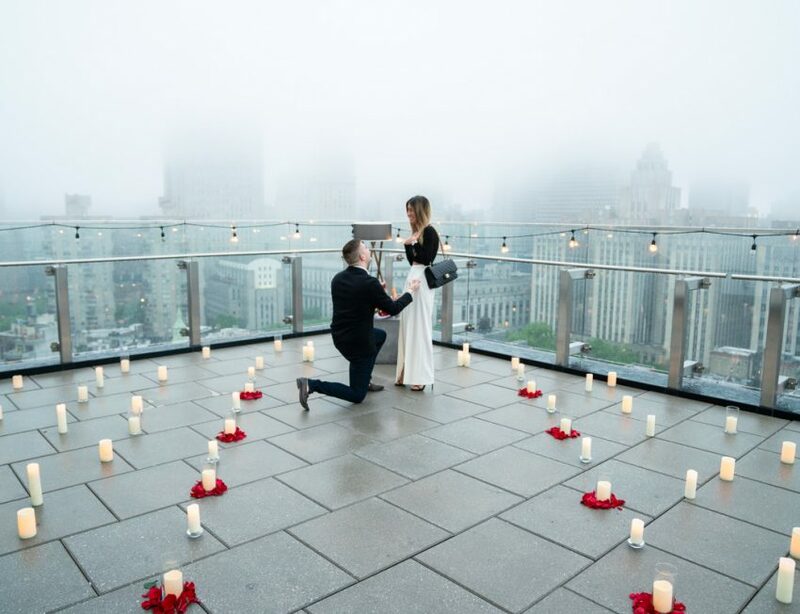 With the entire city as your backdrop, your proposal photos will be like a scene right out of a romantic movie. The Brooklyn Bridge is another great place to propose in NYC, but be mindful of traffic. Our team can help you coordinate an early morning proposal in the middle of the bridge, creating the perfect photo-ready moment. 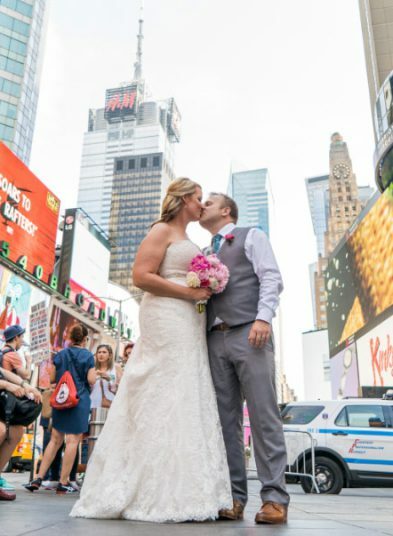 For a fun alternative, visit DUMBO (short for Down Under the Manhattan Bridge Overpass) and head to Washington Street to pop the question with historic red-brick buildings framing the bridge in your background. Other nearby areas to consider include the Brooklyn Promenade with it’s stunning Manhattan skyline view and charming, vintage carousel. 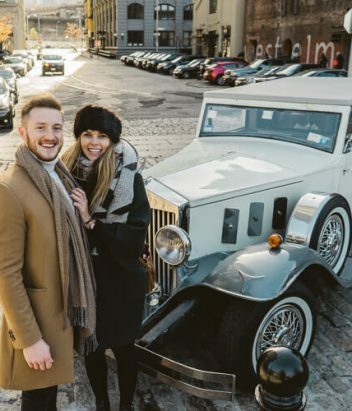 These popular places can become quite crowded, which is where assistance from an experienced proposal planner can help you find the perfect time. Due to its careful design, Central Park beautiful and proposal-ready in any season. During the summer, pack a romantic picnic by the Bow Bridge or take your beloved out on the lake in a rowboat. In the fall, a horse carriage ride is iconic and fun, made even cozier while you’re surrounded by colorful foliage. When the temperature drops, Central Park’s ice skating rink is beautiful and romantic, so skate out to the middle of the rink and pop the question with the city skyline glittering like stars behind you. 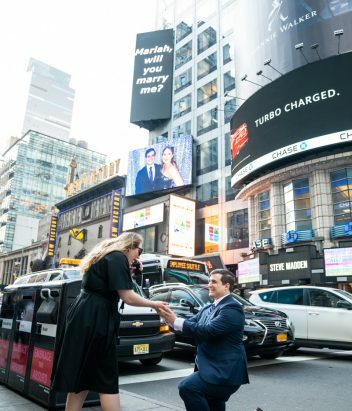 If it’s a flashy, statement-making proposal you’re after, nothing is more fun than taking over a billboard in Times Square! Your beloved will be absolutely stunned to see their picture on the big screen in the middle of the most famous intersection in the world. Want to make it even bigger? Our team can help you coordinate an entire flash mob of dancers, creating a huge, joyous celebration of your love while you get down on one knee to ask the big question. 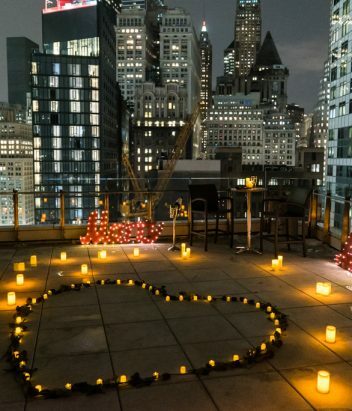 For something a bit more intimate, a private rooftop may be just what you’re looking for. Our team has access to multiple venues around the city, most with both inside and outside spaces, so no snow or rain could ruin your plans. 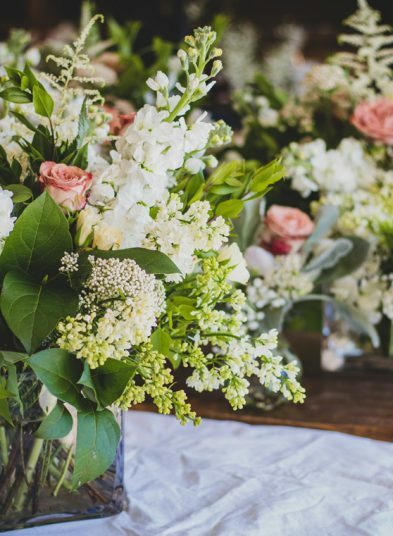 Imagine a path lined with candles and rose petals, leading to you in your finest evening wear, ready to pop the question, champagne chilling for you to toast your next chapter together after you hear that enthusiastic, “Yes!” Perhaps a peaceful, secret garden is more your style? Our connections allow us access to the most charming, romantic garden space in the city. Picture twinkling fairy lights strung above you while the bustling sounds of the city fade away. 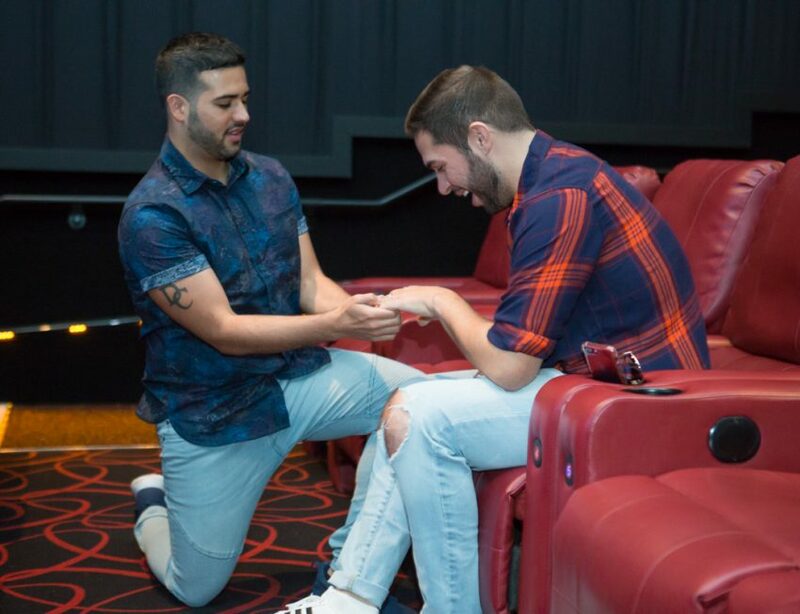 It’s just the two of you, in a perfectly intimate, romantic setting to propose. 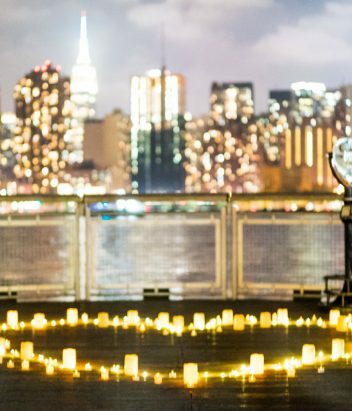 For a fairytale proposal in New York City, our team has you covered with creative, Disney-inspired proposal ideas. Make her feel like a princess when she enters one of New York’s historic mansions, filled with candles and an enchanted rose waiting just for her. We can even create a Cinderella-style proposal with a beautiful glass slipper. 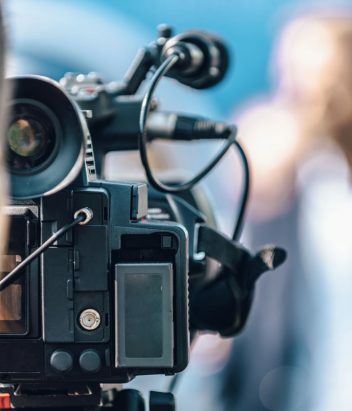 Why not create a fairytale of your own by recording a special, customized movie trailer? 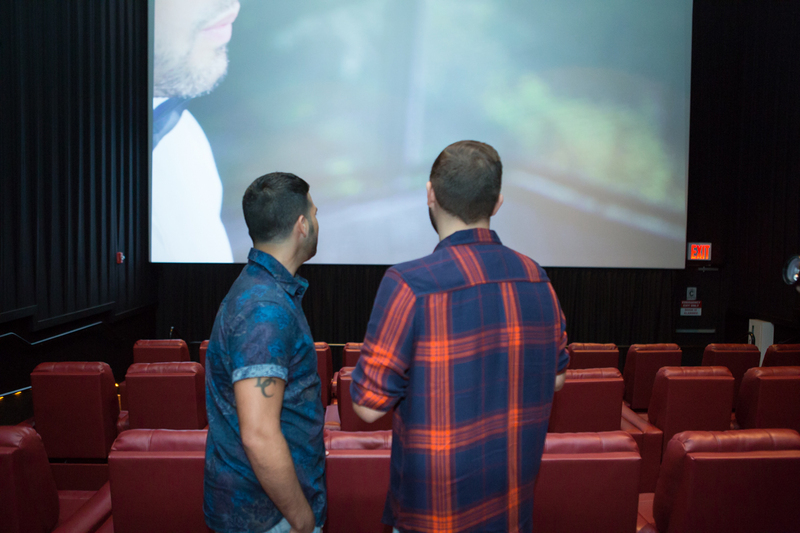 We can help you rent out a movie theater just for you two to enjoy a special screening. More important than the venue is that your marriage proposal should be deeply personal, drawing inspiration from your relationship. You know your partner better than anyone! Does he or she love being the center of attention or would they prefer something more private? 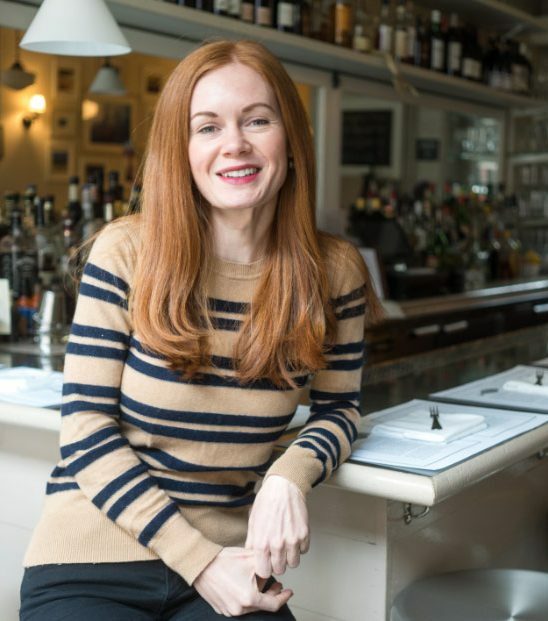 Is there a special place in New York City that has meaning to you both? 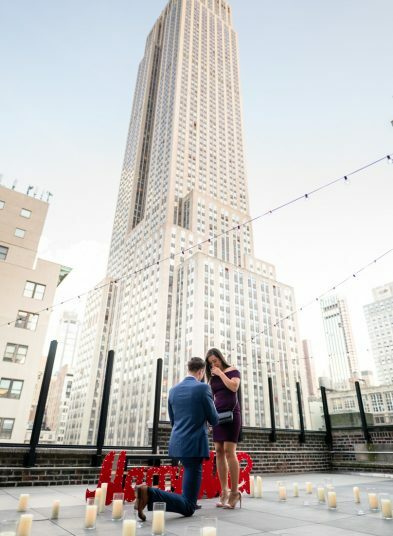 Whatever your marriage proposal idea is, our experienced team will help you brainstorm bespoke options to design the perfect, customized NYC engagement package. You dared to dream; we create.